Among American theatre writers, Arthur Miller’s Death of a Salesman is almost universally acclaimed as one of the top two or three American plays. In recent years, it has been revived on Broadway multiple times, and it has been a career bench mark for many of our greatest actors, from Lee J. Cobb (of the original Broadway cast) to Dustin Hoffman, to Brian Dennehy and, currently on Broadway, Philip Seymour Hall. Around the world, it is recognized as one of the greatest takes on the downside of “The American Dream” in all of our national literature. It is the story of salesman Willy Loman, who desperately clings to a false dream of success based on likeability and perennial optimism. He refuses to give up his dream even in the face of every imaginable contrary indication. In the end he commits suicide for the sake of an insurance settlement rather than accept the reality of failure (his own and his sons), even though he is admired by his wife and loved by family and friends. He finds a tragic end because of his refusal to truly know and accept himself and his sons as he is and they are. Had he done so, he might have found happiness in reasonable compromise, as does his neighbor and loyal friend Charley. He is a good man, devoted to his family, but ultimately destroyed by his blind adoration of essentially shallow values. Miller constructed his plays along the lines of a classical Greek tragedy, and the forces that move Willy toward his inevitable death move on the audience like a force of nature. It is one of the most affecting plays in the American canon. Actor’s Theatre of San Francisco has mounted a workmanlike rendition of this classic, featuring bravura lead performances by Christian Phillips as Willy and Nicholas Russell as Biff, and adequate performances from a skillful, but less experienced, supporting cast. Direction by Keith Phillips lacks the ideal fluidity and dreamlike quality which Miller called for, but is straightforward and tells the story with clarity. The production works best in exploring the relationship of Willy and his oldest son Biff. Willy worships Biff and cannot understand his son’s lack of success. Biff, in his mid thirties, newly released from jail after serving time for theft, has begun to understand himself and develop his own more realistic dreams of a good life. 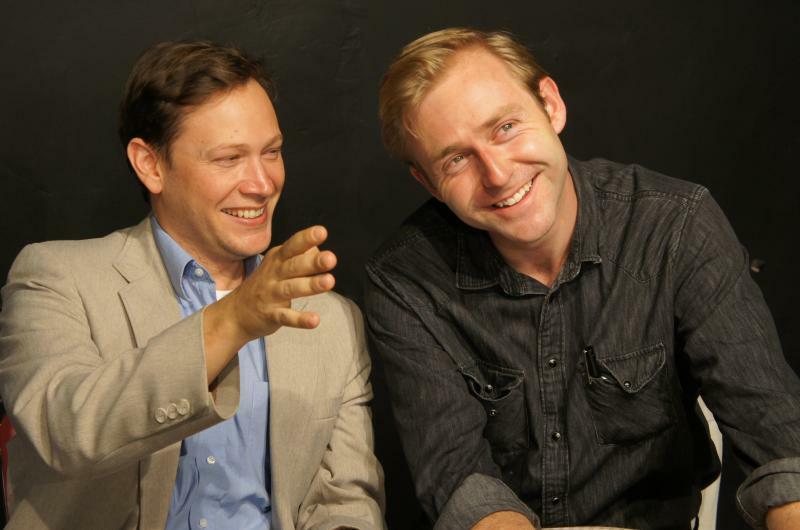 Christian Haynes as Happy and Nicholas Russell as Biff in Actors Theatre of San Francisco’s revival of Arthur Miller’s “Death of a Salesman”. Photo credit: Actors Theatre of San Francisco. Christian Phillips is painful and quite thrilling to watch as Willy vacillates between a puppy like desperation to be admired and loved, and an explosive rage at his sense of loss and humiliation. Sometimes he moves back and forth between these two extremes in a matter of seconds, but always with authenticity. Here he demonstrates yet again that he is one of the Bay area’s most accomplished actors. Nicholas Russell’s Biff is soft spoken and reflective, even contemplative, as befits a man who is at heart a lover of nature and most at home in the outdoors. It is an unusual approach to the role, and works well. Carole Robinson as Linda Loman is appropriately moving in her pleas that her sons treat her father with dignity, and strikes the right emotional tone in delivering the famous soliloquy at Willy’s graveside that climaxes the play. Death of a Salesman continues at Actors Theatre of San Francisco through July 20th. For further information, click here. “Death of a Salesman” by Arthur Miller, produced by Actors Theatre of San Francisco. Director: Keith Phillips. Technical Director: James Baldock. Set Design: Biz Duncan. Costume Design: Carole Robinson. Sound Design: James Baldock. Willy Loman: Christian Phillips. Linda Loman: Carole Robinson. Biff Loman: Nicholas Russell. Happy Loman: Christian Haynes. Bernard; Randy Blair. The Woman: Jessica Risco. Charley: John Krause. Ben: Marvin Glass. Howard: Sean Brennis Hallinan. Jenny: Karen Goldstein. Stanley: Kevin Daniels. Ms. Forsythe: Sydney Gamble. Letta: Kelli McCrann. Posted in Reviews.Tagged Actors' Theatre of San Francisco, Arthur Miller, Brian Dennehy, Carole Robinson, Christian Haynes, Christian Phillips, Death of a Salesman, Dustin Hoffman, Jessica Risco, John Krause, Karen Goldstein, Keith Phillips, Kelli McCrann, Kevin Daniels, Lee J. Cobb, Marvin Glass, Nicholas Russell, Philip Seymour Hall, Randy Blair, Sean Brennis Hallinan, Sydney Gamble.